"Some jobs are simply better than others. Very few kids growing up say, “I want to work in an office doing monotonous tasks over and over again until I die.” That’s partially because kids aren’t as morbid as this writer, but it’s also because they aspire to dream. They want to be firefighters, doctors, pilots, and my personal favorite, rock stars. There’s a place where that musical dream can still become a reality. The beautiful part of it is that it’s a rapidly growing industry based completely around good times, scenic views and constant entertainment. It’s the cruise ship entertainment industry, and this is how you “get in.” If you want to know more about life aboard a cruise ship as an entertainer, read one of our other blogs. 1) Get a cruise ship agent. The reason everyone’s not doing this is because they don’t know the right people. Agents do. Many of the cruise lines exclusively use entertainment agents for their talent sourcing. You may be asking why that is. Simply put, these maritime mega-corporations don’t have the time, resources, or desire to sift through thousands of applicants. Therefore, they seek out relationships with trusted companies who will provide extra assurance that the talent will be top-notch. +When should an indie band take on a booking agent, as opposed to booking their own shows? 2) Create quality and relevant content. In the corporate side of the music industry, presentation is everything. If you’re a dancer, you need a solid show reel and some headshots. If you’re a guitarist, have a One Sheet ready with a demo video of live performances only, and a performance resume. No company cares how amazing you are in your garage. They want to see high quality audio/video of you performing in front of a live audience. A typical format is 10 clips of 20-40 second song snippets performed in front of a live audience. Edit these together with very minimalist, direct titles and transitions to ensure that you’re not wasting a recruiter’s time. Also, have a set of at least three high-quality professional headshots. Image is very important to these companies. This is a very basic example of one of my old showreels, but it gets the point across. Music jobs are far and few between and it’s an incredibly competitive international marketplace. Therefore, you should treat your first impressions the same as if you were applying for any other high-level job. I’m not saying you need to cover your tattoos, but throw on long sleeves, take out any facial piercings, put on a tie or a formal dress and treat it the same as any other application process. There are no cruise lines that accept this. Each line does random drug tests and typically require a pre-employment medical that requires a urine or blood test for all drugs, prescription and otherwise. I know what you’re thinking. How are you going to channel Hendrix without the devil’s lettuce? I suppose you could wear more scarves, but unfortunately this is a non-negotiable part of maritime work. Even if you’re lucky enough to be from a state or country where it is legal, these companies will not tolerate it. Because of the intense nature of evacuation situations, the size limitations on life boats, and general image control, cruise lines are now requiring their employees to be under a certain BMI. When you’re employed by a cruise line, you are also entering into their insurance and benefits. Therefore, if you are just as qualified as a someone ten years younger and much healthier than you, they are more likely to get the job simply from a risk assessment standpoint. Bear in mind as well, that the aforementioned pre-employment medical will unearth any and all health risks to the company and your agency. 6) Get a passport ASAP. Long story short, get yourself a passport book that you can tattoo with stamps from all over the world, immediately. The process can take up to 2 months in peak seasons and with the sporadic on-and-off hiring periods of the cruise industry, you may get an emergency offer to start in a matter of days. Passports are good for ten years and cost less than $200, so get on it! 7) Invest in quality gear. 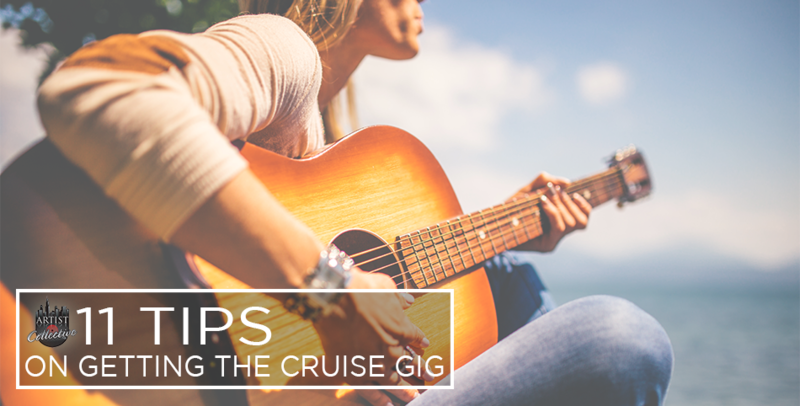 Many cruise lines provide the amps, PA’s, and cables/mics for entertainers, but there are still many parts of the gig you need to provide yourself. Get high quality gear, invest a little more than you normally would and get two of everything you may need onboard. If you only have one daisy chain cable and it snaps on a sea-day, you may not see civilization for half a week. Therefore, stock up on high-quality gear with an emphasis in durability so the show can go on and you keep a job. 8) Create a performance resume. This a required part of just about every application process. Outline your formal training, live experience, and verifiable credentials in a professional format. You can Google all sorts of template examples for this. Keep it simple and direct, and save it in a PDF format. 9) Complete your application process quickly. As an agent, you will get emergency fill-in opportunities almost weekly for various entertainment slots. These are typically first come, first serve and can be a god-send for those desperately looking for work. Getting all applications in place can be the difference between snagging a 6-month contract or not. Certain nuances and specific details of the application process may not make sense to you, but agents know the recruiters personally. They know what they look for and what subtle, seemingly innocuous adjustments mean to each company. Something as simple as an incorrectly formatted video could make your application completely void. Cruise ship gigs are oftentimes booked half a year in advance. Other times, there are emergency fill-ins that need you on a plane with a couple days notice. So get your application in as soon as you can, and then strap in for the long haul. If you’re dreaming of riding the waves as a cruise entertainer, there’s your head start.Artist Collective specializes in recruiting and assisting all sorts of talented individuals to get where they want to go. Submit your music today!"